To provide the most comprehensive medical transportation services, Sky Nurses provides stretcher services on commercial airlines or private jets and charter flight services. 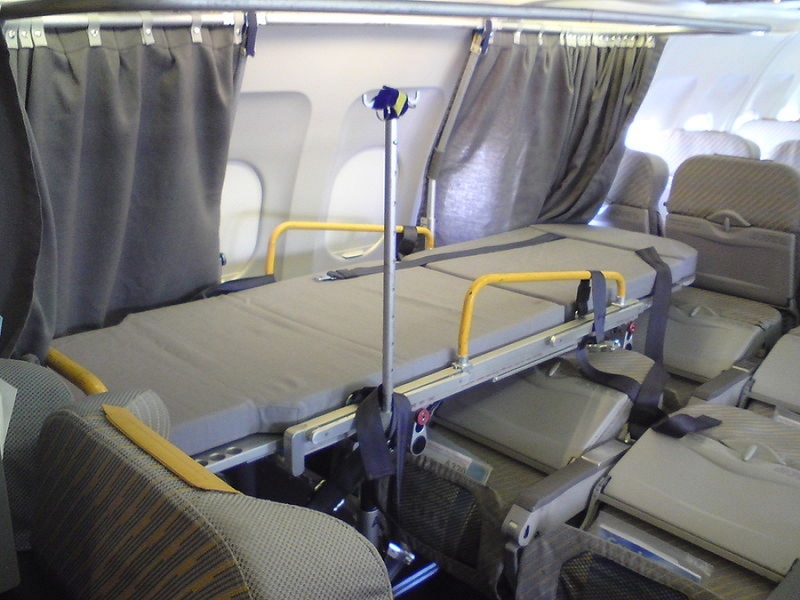 A stretcher service is considered a good fit for any patient who is in stable condition but is unable to sit in a standard airline seat during aircraft taxiing, takeoff and landing. Commercial airline stretcher service requires significant planning and coordination - you can find this expertise at Sky Nurses. We are highly experienced in providing international stretcher services, having successfully completed hundreds of these missions from all over the world with all airlines that offer stretcher service. The medical departments of these airlines recognize and respect Sky Nurses, having had very positive experiences working with our staff in requesting medical clearance and orchestrating the execution of these trips. At Sky Nurses, we pride ourselves in providing our patients with top quality medical care while on any flight, but there is an extra level of care that comes with a stretcher service. With two clinicians generally assigned to each stretcher case, the patient will be in good hands for the duration of the flight and beyond. Our stretcher services are an extremely cost-effective solution for non-emergency transportation when compared with the cost of an air ambulance. You are still provided compassionate, high-quality medical care without the excessive costs. When you select Sky Nurses for a stretcher service, you can rest easy knowing that all of our clinicians are held to the highest standards. Our current policies and procedures focus on ensuring that all patients, regardless of their personal situations and needs, are treated with the dignity and courtesy that they deserve. Our mission is to safely transport our patients in a manner that is consistent with our core values and standards, which exceed industry requirements. Call us today to learn more about our stretcher services for patients worldwide. Sky Nurses coordinates domestic and international medical transportation and evacuation utilizing licensed medical professionals. Sky Nurses does not own, lease or operate any aircraft. All air transportation is completed by commercial airline or licensed and insured private jet or charter flight service.